Finally! 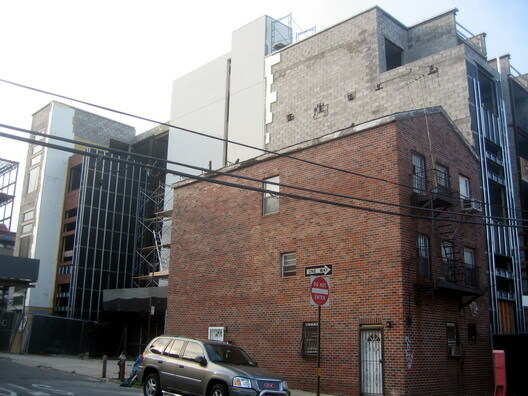 The building we like to call The Bunker on Bond and Carroll Streets in Gowanus because of its stunning street-side lack of windows abundance of wall space, is getting a skin. The facade appears to be white. You will also note the exterior wood paneling, which is a trademark of architect Robert Scarano on some of his buildings. Unfortunately, we're not sure any sort of exterior treatment will be able to liven up the window-deficient wall space-abundant face The Bunker turns to Bond Street. i guess your lack of vision can call it whatever you like. but i was on the building last week and each and every appartment has alot of windows. There's another, much smaller, apartment building going up on State Street and Hoyt that also has unique windows (tall, thin and vertical) and wood paneling on the facade. I think the wood paneling on the Bond bunker looks pretty cool so far. Scarano is a plague. Someone please stop him.